Losing the data from your iPhone can happen for lots of reasons, including:your iPhone are broken or stolen; all data in iPhone is erased when repairing; data loses after iOS upgrade; intentionally or accidentally delete files from your iPhone; iPhone factory resetting; corruption making data loss. No one can predict when the disaster will strike, but it happens. Therefore, do not forget to make regular backups for your important data. Then you can easily restore your iPhone from backup files. If you use iTunes as your iPhone manager, you should know there is auto backup generated by iTunes when you sync iPhone with it. However, things go a little difficultly. The iTunes-generated backup is a SQlitedb file, which you can't view, or extract any content from. To get the content, you need a recovery that allows you to preview and restore iPhone from the backup. My recommendation is Wondershare Dr.Fone for iOS Mac, or Wondershare Dr.Fone for iOS, which enables you to preview and restore the backup file, no matter you are using iPhone 5, 4S, 4, 3GS, or other models. You can restore them all or restore them selectively. Download the trial version below for free to have a try. Note: Wondershare Dr.Fone also enables you to scan and recover data from iPhone 5/4S/4/3GS directly, when you don't have iTunes backup. Next, let's check how to restore iPhone from backup with Wondershare Dr.Fone (for Windows) in steps. Launch the program and choose "Recover from iTunes Backup File" on the top. Don't connect and sync your iPhone with iTunes when you are restoring iPhone from backup. 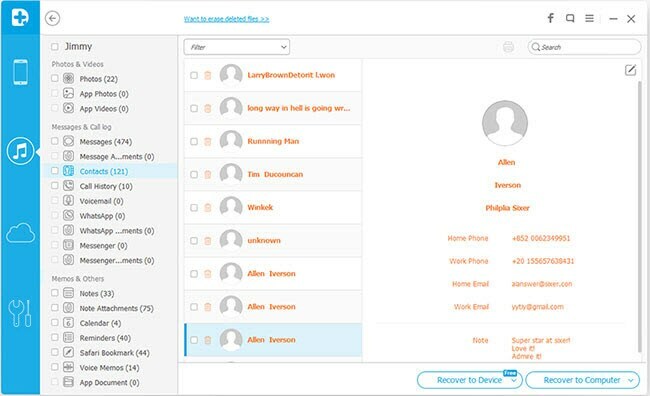 All device backup files will be displayed automatically. Here you only need to choose the one that you want to restore, and proceed to "Scan". Here all files in the backup has been displayed, and you can preview and check them one by one. After preview, check those you want back and hit to "Recover" and save them. 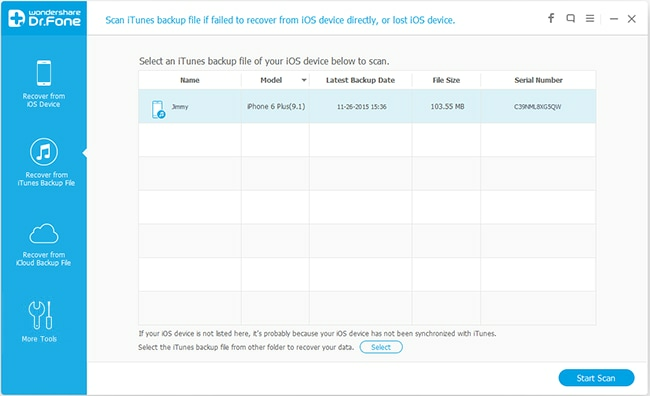 To prevent data losing from your iPhone, please remember to backup it on your computer well. Note: Wondershare Dr.Fone also allows you to directly scan and recover data from iPhone 5/4S/4/3GS, when you don't have iTunes backup.